Leading supplier David Spear is no stranger to the commercial van market, and the company’s expertise is renowned not just in Wales but the rest of the UK. David Spear Commercial Vehicles regularly reviews vehicle makes and models as they hit the market – enabling their customers to make confident choices about their van or 4×4 purchase – the latest being the Nissan Navara. Scoring highly on styling, engine design and size, the most recent Nissan Navara model is evidently one of the best double-cab 4×4 pickups on the market with its low ratio gearbox offering an unrivalled off road experience as well as its highly responsive steering providing the composure and control at speed not often seen in pickup truck models. “Looking under the bonnet, the Nissan Navara’s 2.3 litre diesel engine offers a smooth and refined drive, whilst its twin-turbo version boosts output to 187bhp. As with all Nissan models, the Navara uses autonomous braking technology allowing the customer to enjoy low insurance groupings. The higher spec model also comes with its perks and boasts a touchscreen sat-nav among other features,” said Owner David Spear. As part of their review, the David Spear team also analysed the appearance of the Navara, which replicates the ‘smiley’ grille and front lights you expect from the brand, as see on other models such as the Qashqai and Pathfinder. The Navara however is much more aerodynamic, a design feature that reduces drag and enhances fuel efficiency. The low end torque engine also makes better fuel efficiency possible with an 11% saving in comparison with similar models. 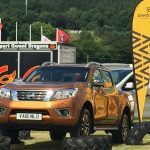 “There’s no doubt that these vehicles offer fantastic performance and great value for money, and thanks to our buying strategy, we can source Nissan Navara pickups at discounted rates and pass this discount onto our customers. List price on the manual is £24,012.50 + VAT and for an automatic £25,425.17 + VAT, but you can buy a manual from us at £21,490.00 + VAT and £22,490.00 + VAT on the automatic which equates to considerable savings whatever your preference,” concluded David.